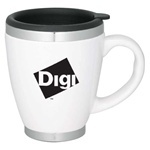 The stainless steel mugs from LogoToYou.com can catapult your company’s promotional materials from dull to professional and sleek. Each of these mugs has a design as unique as your business and provides logo placement on an item that everyone wants and needs. 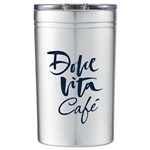 Whether you are looking for steel tumblers, aluminum travel mugs or stainless steel water bottles, you can find those items and much more here. Custom Imprinted Vacuum Bottle 16.9oz features double-wall durable construction. Custom City Stainless Steel 3-Piece Set is made from stainless steel. 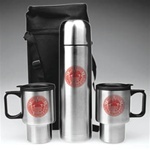 Personalized Stainless Steel Three Piece City Set features one 16-ounce stainless steel super saver travel mugs and one ½ liter vacuum insulated beverage carrier. 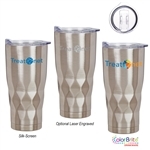 Stainless steel travel mugs are the perfect items to customize and use for giveaways as they appeal to a broad range of people. These easy to personalize items can be used to insulate hot and cold beverages and many people prefer to use them for transporting their coffee around. These handy items can insulate hot drinks all day and are big enough to enjoy multiple cups or share with your colleagues. 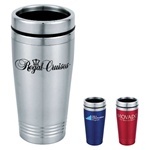 Since these stainless items are sizeable, they have larger areas for custom printing logos and designs. Now companies can use them to promote their brand and services by handing them out at trade shows and other promotional events. 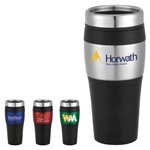 Order these quick to personalize travel mugs today and start using them as an affordable marketing tool that won’t leave you without an advertising budget, but will leave users with a lasting impression of your company. 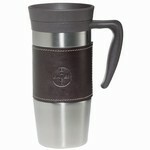 Take a look at the styles Logo To You carry for all your promotional needs. From wholesale to engraved, handles and lids, we have something for everyone. You can quickly and easily customize these stainless steel travel mugs, thanks to our art team and online ordering forms. Select which flasks or thermos you want and either upload your artwork or logo or talk to our art department about images, colors, and text. Before finalizing your order, we will give you an artwork proof at no additional charge so you can get an idea of how the products will look once they’re done. 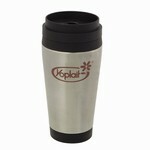 Personalize travel mugs for your clients and prospects to get their attention and remind them of your services. The durable bodies are available in a range of vivid colors and can be printed or engraved to take your brand to the next level. Simply follow the steps during the ordering process to customize your purchase and take advantage of our free art service. For any questions, contact our customer service department who will assist with your order. Take a look at our range of promotional products that will get your brand noticed and be remembered. Each of our mugs is made compliant with FDA standards and can be customized with not only your business logo, but modern grips, non-slip bottoms and no-leak lids. 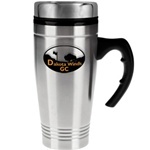 We offer a wide selection of modern and traditional stainless steel mug designs, each hand selected for their reliability, high quality and durability. 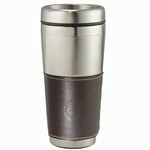 So take advantage of our unique products as well as our free art service and proofs by beginning your stainless steel mug design process with LogoToYou.com right away. Don’t let your promotional materials be dull and boring any longer.